Everyone wants smooth, soft skin. Men, and women. There are so many choices out there sometimes it is hard to know which one to choose for your best results. Sometimes the best way to pick the right lotion for you is to hear what others have said who have already used the product. So, to that end, we have decided to provide those looking for help with dry, cracked skin a top 10 list of creams and lotions that have received high marks from those that have already used them. This dry skin healing cream was developed by dermatologists for people with very dry skin on the elbows, hands, knees, and feet. Containing emollients, conditioners, and 20% urea, Excipial exfoliates, hydrates, and helps to soothe the rough dry areas on our bodies by restoring our skin’s natural hydration. The non-greasy lotion is absorbed quickly and helps to moisturize all day while relieving the itchiness and redness. This is a non-scented cream which is important as many people around you can be affected by the strong scents of perfumes and creams. People are very happy with the results this lotion provided for their skin, especially on dry, cracked heels. This moisturizing cream has been clinically proven to provide immediate and lasting relief from extremely dry skin. The ingredients in Cetaphil seal the water in your skin, helping to prevent moisture loss. This cream is dermatologist tested and is for chronic, sensitive, dry skin all over. Fragrance-free as well as no parabens, lanolin or mineral oil. The reviews for this product are very good with 5-star recommendations from people with sensitive skin to those suffering from eczema. 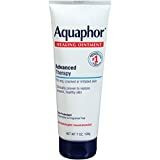 Aquaphor is an all over lotion that restores your cracked and dry skin to smooth and healthy skin. This cream will help heal any problem areas, including nail cuticles and chapped lips. With 41% petroleum, your skin is protected and oxygen is allowed to flow over it while the other active ingredients like glycerin and panthenol help moisturize and heal. This rich cream wraps your body in moisture and starts to heal your skin almost instantly. It is fast absorbing and leaves your body hydrated and smooth. You can start snapping your fingers in beat with your singing right after using this lotion. Using a high glycerin formula this cream starts delivering hydration to your skin while soothing it. Gold Bond is a well-known brand and they live up to their reputation with this non-greasy cream. It has 7 intensive moisturizers, providing 24-hour relief and healing for your skin. Additionally, it does have a slight scent to it, but in no way overpowering as some dry skin lotions do. Moreover, it is a thick cream and goes on light and smooth and getting rid of any cracked, dry skin areas, especially on the feet and elbow areas. Furthermore, people from young to older have spoken very highly of the benefits of this product. A light lotion that will exfoliate and moisturize your skin. Containing ceramides, which are found naturally in the top layer of our skin, this cream adds a protective layer helping to plump up your skin cells, keep moisture in and repair any damage. Likewise, this protective barrier keeps the harsh elements that we face every day from harming our skin. Hypoallergenic, fragrance-free and good for sensitive skin, this cream will help get rid of those rough patches. Furthermre, people who use Cerave Sa have been very happy with the results overall and quite a few use it all over, including under the eyes to help reduce inherited dark circles due to their skin tones. This product not only helps heal dry rough areas on your body but also defends against age spots and wrinkles. Although the word hand cream is on the bottle, it is an all over lotion. Additionally, the cream is highly recommended for people with sensitive skin and is not greasy. As we get older, our body doesn’t retain moisture the same way, and this deep therapy cream will help with that by hydrating every inch. Moreover, there is a light cocoa scent when you first put it on, but it will fade fairly quickly. Vegan-friendly, this hand cream lotion receives great reviews from anyone who has used it. Another lotion that contains ceramides, this cream is also fragrance-free and not greasy to the touch. The therapy lotion gives instant visible results to any rough, dry and flaky skin so you can wear that sleeveless top or dress with confidence. Additionally, with the combination of ceramides and alpha-hydroxy acid, your skin is exfoliated and given a layer of protection at the same time to help rejuvenate softer, smoother skin all over. User reports have a very satisfied theme for various skin issues. One of the few lotions I’ve seen with the information that they are safe for people with diabetes to use. 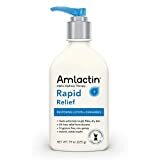 This lotion delivers effective 48 hours relief from dry itchy skin. 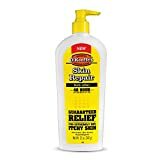 O’Keefe’s lotion is a concentrated formula to help protect your skin from the harsher weather elements while repairing existing damage. 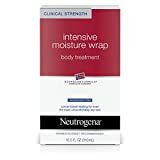 Absorbing quickly and waterproof it is an excellent product to help you achieve smooth soft feeling skin. Reviews of this product are overwhelmingly positive, especially by people with dry hands. This lotion also combines ceramides, alpha-hydroxy, and uses glycerol in its formula. With this combination, it helps you to quickly achieve beautifully smooth skin. Additionally, it absorbs quickly and is fragrance-free. Furthermore, the cream protects you and alleviates sore cracked skin, hydrating and protecting. Moreover, you can use this product all over for great looking and feeling results. People who have used this lotion have given it high marks for helping them with extremely dry skin. All of the above products have received great reviews by the people who have used them. One thing to remember is that these are lotions for healing dry skin. They do not protect from sun-exposure and you should always use sunscreen. Hopefully, this list will provide you with better information on what lotion will be best for you, and that you will soon be feeling the relief, and confidence that beautiful, silky skin helps bring.